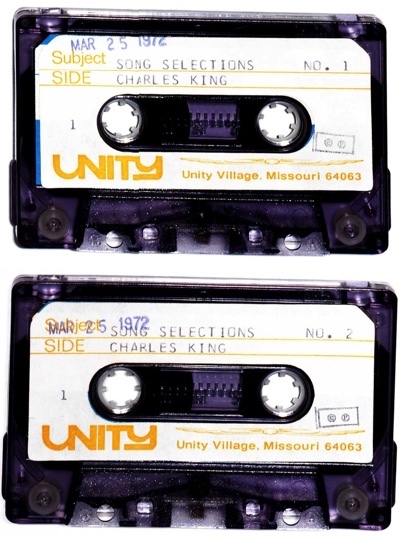 Here are recordings of 21 songs performed by Charles King back in the 1970s. I’m sharing them today because of the many comments I received from last week’s post. One writer said “He gave us a wonderful evening full of love and beautiful music. His high energy vibration moved me deeply. He spoke a short personal message to me, that I have never forgotten.” He was so effective in bringing young people into Unity that the Association ordained him in 1982. And 7,000 people showed up when he co-hosted the Unity Convention in 1970. What is it about this music? To find out, I’m asking you for some help. Would you listen to these recordings and select one or more of them that elicits in you an inspirational thought or idea? And would you then share with me that inspirational thought or idea in one or two sentences in an email? Just click reply or send it to me at mark (at) truthunity (dot) net. Be sure to say which recording you’re reflecting upon and to keep your thought as short as possible. Used with permission of Manna Music, Inc.
Ruth Doran: I remember #10 from my childhood and have sung it to myself many times when seeing something extra beautiful and moving. Joanna Gabriel: I have felt overwhelmed on many, many occasions and this is one of my favorite “go to” songs that activates my faith. I am renewed when I think about all the times there has been a way made out of “seeming no way” and this “remembering” helps me go forward in faith. Joanna Gabriel: I remember hearing this for the first time. It is a revising of the song “Old Time Religion”. I was so impressed because for me on a personal level this Unity message, which is the Christ message, helps me love everybody, seek God within me, build for tomorrow…….and my thinking is the key. It captures what we believe in a few simple lines and to me is just as important as that traditional hymn “A Mighty Fortress Is Our God” or “How Firm The Foundation”. Joanna Gabriel: This song just makes me feel happy. I can sing it and all worries cease. When I teach a class I usually designate a class song, and this is one. One of the first things I learned in Unity was "change your thinking, change your world". I change the atmosphere around me when I sing this song. 17 Why Not Have It? Joanna Gabriel: Charles King is amazing. I love his voice and how he energized us. But Rev. Ruth Moseley made this song really come alive for me. She added verses and I have fond memories of her leading us in the singing of it. 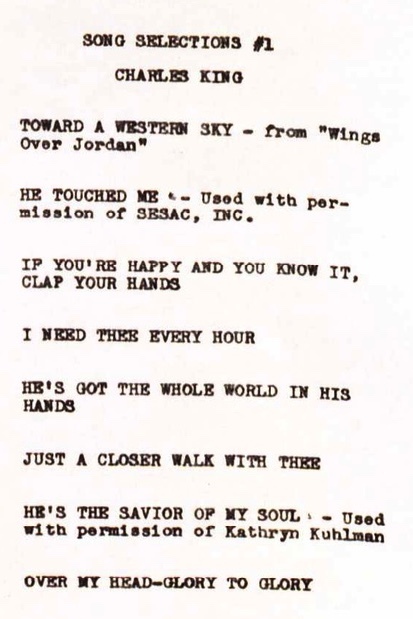 At the Urban School, many of our meetings began with song and this is one of my favorite. And it has been one of my class songs over the years. Joanna Gabriel: I never teach a prosperity class without this song. 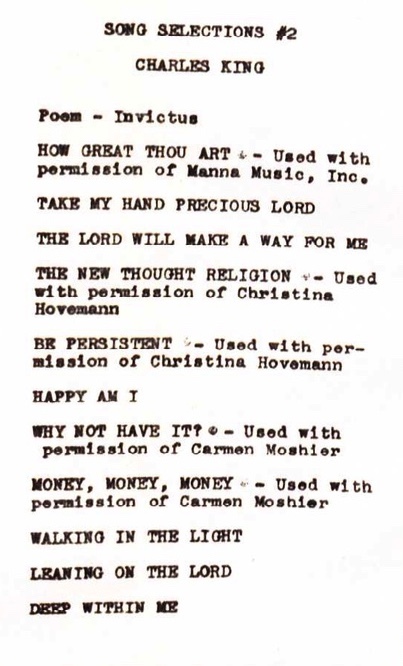 Using hand gestures and a happy countenance, this song activates my prosperity consciousness. I have sung it, at times, while making out my bills, or handling my money. This is another one that I heard Charles King sing, but Rev. Ruth is the one that carried it on. It was something about how her face lit up with happiness when she sang it with such fervor. I think she convinced us all that what we were singing was true. Joanna Gabriel: God’s love, God’s peace, etc. is deep within me ever satisfying my soul. It was so wonderful to hear Charles King sing this. It’s one of my favorites. Charles Fillmore, in Talks on Truth, reminds us to “reform our God thought”. This song helps me do that. It reminds me where to look for God, not in the sky, not outside of myself, but within me. It is a faith activator. I used this in my Talks on Truth and Lessons in Truth classes. It is a song that is great to open a prayer meeting or close a meeting.